Digital Transformation Made EASY! The Business Platform Sales Organizations LOVE to Use. If you're looking for a reliable way to QUICKLY & EASILY integrate & streamline ALL your data into a singular, contextual, agile platform that works with all the technology you already have in place, then the iConnect OneView Dashboard is where you'll want to begin. The iConnect OneView Dashboard is the first data-centric platform that simplifies the Digital Transformation process of streamlining and integrating ALL your data silos into a singular, contextual, agile platform that empowers & connects ALL your departments across the organization to share, access & update your data in real-time from a single source to help you run your business better. 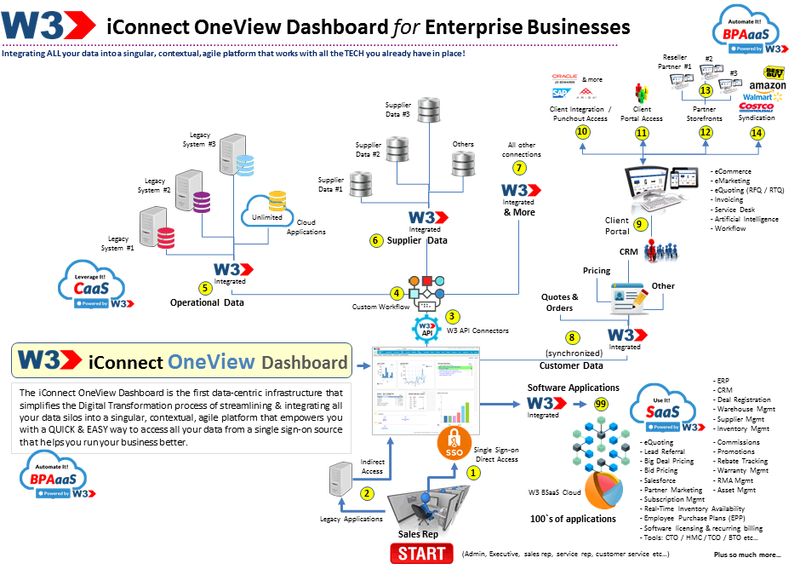 Using W3's advanced API & XML connectors, communicating, sharing & updating data in real-time across ALL departments, including data from your legacy systems, suppliers, 3rd party software applications and cloud based business solutions is EASY through your iConnect OneView Dashboard! With W3 and the TECH you already have in place, the iConnect OneView Dashboard can help you QUICKLY & EASILY streamline, automate and scale your business in the Cloud the way you've always envisioned. Managing Digital Transformations from start to finish. DIGITAL Transformations are about turning GOOD Sales Organization into that of being GREAT ones and it ALL begins in the back office by streamlining, automating and connecting ALL your data into a singular, contextual, agile platform that works better together. DIGITAL transformation success depends on accurate Current State Business Process knowledge. Assumptions & failing to plan are land mines waiting to explode and erode your ROI & potentially kill your project. Using our Start Smart eBusiness Review, W3 will capture and document your Current State Business Work Flow map and with careful planning, we'll produce your Future State Business Process map in order to create & outline the most strategic deployment strategy along with producing a GAP Analysis report. Using W3's proven deployment strategy, we'll identify, group & package compatible features & benefits into Phased mini-projects to be scheduled, implemented and deployed in the proper SEQUENCE in order to derive the MOST benefits in the shortest time frame. 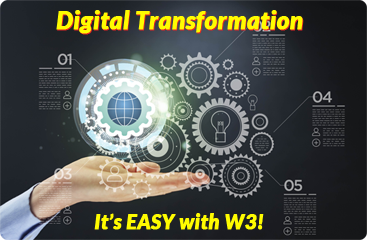 From start to finish, W3 works hand-in-hand with your deployment & implementation team to ensure your transformation is a success. 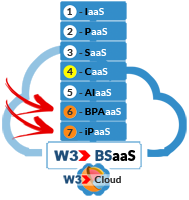 After each Phased implementation and before the next, W3 will work with your user adoption team to ensure your new found processes have been delivered, transferred and accepted by your day-to-day operations team. When it comes to Digital Transformations, process ownership reverts back to your day-to-day operators to recommend and request business process improvements because change in todays DIGITAL world is never ending - as it doesn’t stop once you go-live. 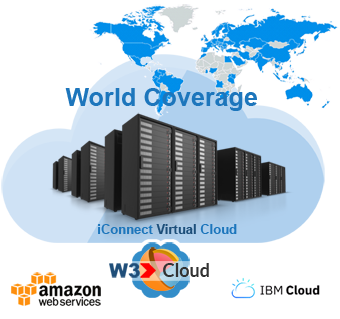 Whether your a business that caters to one or a million (1 to 1,000,000) concurrent users a day, the iConnect Virtual Cloud has you covered. 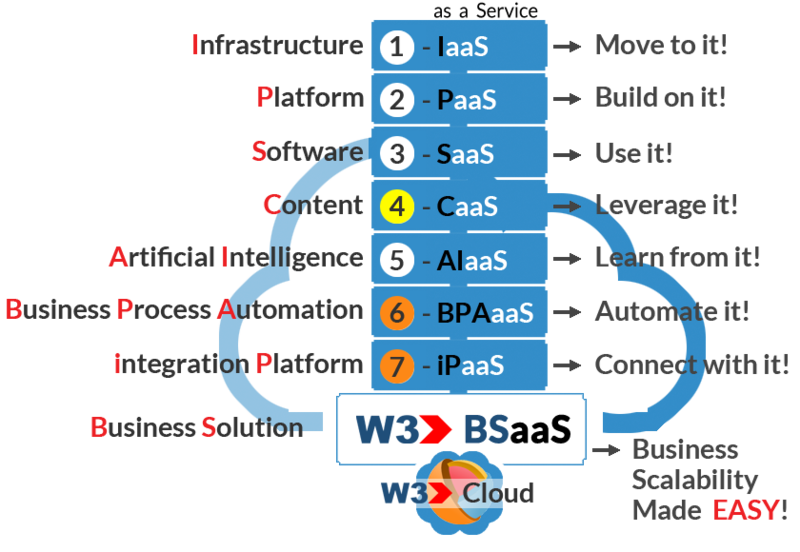 Depending on where you do business within the supply chain, W3 has industry specific solutions according to role to help your run your business better in the cloud by making it EASY on customers to do business with you. To learn more, select the appropriate like below or you can schedule a 15 discovery call with one of our Products Specialists and we'll show you how EASY it is to streamline, automate and DOUBLE your business opportunities via the cloud.